Followings are topics that will be described in this page. Don't get scared of the long list. Overall logic is simple. First, understand the details RLC PDU/SDU structure and go through a lot of examples. How to Identify UMD PDU Type ? As far as I experienced, there are three main topics we have to master on this layer to make our knowledge practical enough to the development or troubleshooting. I will not explain on these topics right now. It will be explained as you go along with this section.. but this part will be updated forever as I get more and more insight on this layer. What do you read from the diagram above ? First you will see the layers labeled 'upper layer' and 'lower layer' ? What does these layer specifically mean ? 'Upper layer' in this case would mean 'RRC layer' or 'PDCP Layer' or in some case (especially in the simulation or testing environment' it can be a TE port ( a kind of data Input/Output port). Then, in which case the upper layer should be RRC Layer and in which case it should be PDCP or TE port ? These are what you have to figure out as you go along this document. And then.. you see another layer labelled 'lower layer'. What is the lower layer in this case ? It is simple. It means 'MAC' layer in most case. There are another small issues that scared me.. it was the term 'entity' which sounded too abstract to me. (it may not be the case for others). I just take the term 'entity' as a kind of 'thread' or 'task' in software terminology. It may not be a perfect analogy but this terminology change made me much more comfortable when I am reading the specs. What else you can read from the diagram above ? One thing I notice is.. There are separate entity (thread or task) for Uplink and Downlink RLC for TM and UM. But in AM, both Uplink and Downlink path are merged into a single entity. Why ? This is also what you have to figure out later. Another picture that I want you to keep in mind is shown below. Most of signaling message is using RLC and each of the message is a specific types of RLC mode, TM/UM/AM. Unlike the channel mapping, the association between each message and RLC type is not so tight meaning that network can allocate RLC types a little bit different from what is shown below, but I would say the following mapping would be a kind of 'Textbook' mapping. As we go through this section, you will see the detailed behavior of each RLC mode. If you try to associate this diagram and the RLC description you will have more practical understanding of RLC and will help you greatly for protocol stack implementation and troubleshooting. 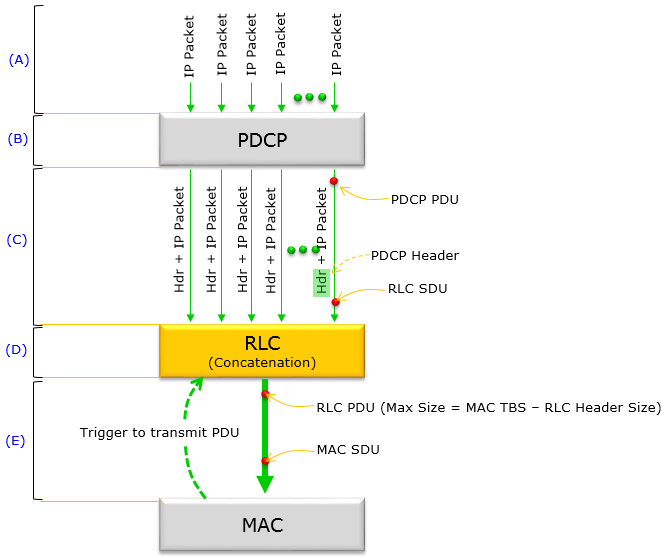 RLC sits between PDCP and MAC layer. I would suggest you to understand how user data follow through these layers. This data flow can be illustrated as below. The illustrations shown here are examples for a specific case (typical max throughput condition). The illustration and comments would need to be changes if the test condition gets different. For now, I am illustrating only one specific cases but you can draw varying illustrations depending on situation. I often see people underestimate the importance of RLC operation and they think RLC is working in a very simple logic. But this may hold trun only before you see some problem. Once you see the problems it would not be easy to troubleshoot. In many case you would see lack of detailed information in both UE log nor in network log. My recommendation for you is to draw this kind of illustrations for as many diverse case as possible and get clear understandings for each case in your own words before you come across any issues. The transmitting flow can be summarized as illustrated below. In this illustration, a lot of details for each layers are not mentioned. I focused only on data flow and how multiple IP packets get merged as it goes through lower layer. More specifically, in this illustration I assume that very large amount of resources (just assume that maximum possible resources) are allocated for MAC/PHY layer. (B) PDCP layer add PDCP header to each of incoming IP packet and send them out. NOTE : If MAC TBS size is assigned to be very small (smaller than the single IP packet), the IP packet gets segmented (as opposed to being concatenated) and requires multiple times of RLC/MAC transmission to send out a whole IP packet. The Recieving flow can be summarized as illustrated below. In this illustration, a lot of details for each layers are not mentioned. I focused only on data flow and how a big packets received at PHY/MAC get splitted into individual IP packets as it goes through higher layer. More specifically, in this illustration I assume that very large amount of resources (just assume that maximum possible resources) are allocated for MAC/PHY layer. (A) MAC layer received a huge packet carrying many IP packets in it and forward it to RLC layer. (B) RLC layer splits (segments) the huge packets into multiple SDUs based on the information carried by RLC header. After this segmentation, RLC header is removed. (D) Each of the packets coming into PDCP is now stripped of PDCP header. For this section as well, let's start reading diagram from the specification. Let's begin with TM mode. As you see in the following diagram, TM is the simplest RLC mode. TM stands for 'Transparent Mode'. The term 'Transparent' may have many different meaning. In this case, it would mean 'the contents goes through this layer without any modification'. The only operation operation being done in this mode is a buffering operation, but even this buffering operation is also very simple. It just keeps the input data for a certain amount of time or until next input data come in, it just discard it if it does not get transmitted within a certain time frame. As you see in the diagram, BCCH, PCCH, CCCH goes through this type of RLC process. In WCDMA, Voice call traffic used this RLC mode as well. It means that even some type of DTCH (voice traffic) uses this mode in WCDMA. However it is technically possible to use TM mode for DTCH as well. As you see, DTCH, MTCH. MCCH use this type of RLC process. Again, this is also a matter of choice. You can use AM or UM mode for DTCH. i) The MAC layer passes the received RLC PDU to the RLC layer. ii) The RLC layer removes the RLC header from the PDU. iv). Pass the assembled SDUs to the PDCP or RRC layers. This parameter indicates the length of Sequence Number field of RLC-UMD. iii) If the received RLC PDU does not have any problem, mark it as positive ACK (but whether the ACK is sent now or sometime later or omitted is determined by some other RLC parameters). v). Pass the assembled SDUs to the PDCP or RRC layers. I think this list can give you another aspect of reading Figure 4.2.1.3.1-1 shown above. This is one way to learn new things. Try to describe it from many different perspective. There will be many things overlapped by multiple perspectives and there will be many things that looks different depending on the perspectives. It will help you to learn it in either ways. In some case, you will learn many things because they are similar and in other case you will learn things because they are different. Segmentation, concatenation, and reassembly: RLC service data units (SDUs) coming from the upper layer are segmented or concatenated to RLC protocol data units (PDUs) which has a predefined size. Each PDU is assigned its own sequence number (SN). RLC AM on reciever side will reassemble these PDUs into SDUs using the sequence number. So allocating the proper Sequence Number is very important in RLC operation. Error correction by ARQ: In AM RLC, if the sender does not receive ACK from the reciever it automatically send the same data again and if the sender recieves the ACK in a predefined time frame it sends the next data. This process is called ARQ. But if RLC is using this ARQ for every transmission, it would create a lot of overhead for the data transmission. So in reality AM RLC is applying ARQ based on a special rules and this rule is defined by various factors like some special timers, polling request etc. These factors will be explained below. Flow control: By changing the window size, RLC can do a kind of flow control. I think it will be helpful to look into some of high level RLC AM parameters (RRC parameters) and correlate these parameters with RLC AM operation process. As I mentioned above, one of the most important feature for RLC AM is ARQ which is designed for reliable data traffic and the key factors for RLC ARQ are various Polling mechanism. Now the question is to figure out the best timing/situation for Poll Request and the best timing/situation for Satus Report. I think some typical example operation would help you understand these parameters and Poll bit operation more intuitively. Following is the list of several important factors to trigger for Poll Request and Satus Report. Following table is based on UMTS RLC AM operation and this triggering mechanism seems to get simpler in LTE. However I would list up more complicated case (UMTS case) togive you more detailed picture. This is the maximum waiting time for Status Report from the other party after it sent a Poll. If Status Report does not arrive until this timer expires after the transmission of a polling request, the sender send Polling Request again. If this flag is set to be TRUE, RLC reciever should send Status Report whenever it finds any missing RLC sequence number except when it is within timerStatusProhibit. This is trigger from MAC layer (not from RLC) which let RLC to send Status Report whenver MAC-hs resets. This is not influenced by timerStatusProhibit. Just for your reference, I put WCDMA RLC parameters in Radio Bearer Setup message as follows. This example would the case that you might see most often in real life communication. This example shows all the RLC traffic both downlink and uplink from power on a UE to the start of YouTube download. This log is captured by Amarisoft OTS 100. Following is the RLC configuration for SRB, DRB set in RRC Connection Setup and RRC Connection Reconfiguration message. I put the decoded RLC headers shown on Amarisoft Web based log viewer, followed by corresponding Hex string. It will be a good practice if you pull out paper and pencil, deocde each hex string by hands and compare it with the decoded result shown on the log viewer. 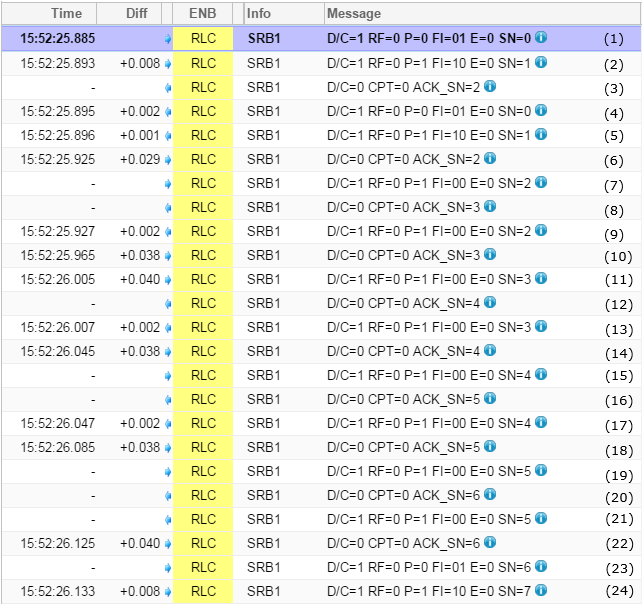 Following is the Hex string of each RLC traffic (PDU) shown above. Try decode these PDU on your own and compare it with the decoded result shown above if you want to get the detailed understanding of RLC PDU structure. Like any data structure, you would not completely understand this structure until you really construct this structure or analyze the structure with real data either in programming or in manually. Of course my recommendation is to analyze manually.. I will put some of real RLC data example later, but for now let's just review the diagram from 3GPP specification and just try to be familiar with them. The first structure is as follows. It is data structure for TMD (TM mode data) structure. What kind of structure you see from the following diagram ? iii) What is the size of the data ? But this data structure has none of these information. It means that the TMD packet does not add any additional (header) to the input data and does not split or combine the data coming into the RLC entity. Then how the size of this TMD PDU is determined ? It is automatically set to be the same size as MAC PDU size. What if the incoming data is bigger than the RLC PDU size ? It just take the initial part of data that can fit into its size and discard the rest of the data. What if the incoming data is smaller than the RLC PDU size ? It just take the whole data and pass it to MAC layer and MAC layer add padding data at the end. Following is a data structure for UMD (UM mode data) structure. What are the meaning of Fl, E, SN ? You should refer to other sets of diagrams later. If you remember the diagram in previous section (Fig 4.2.1.2.1-1), RLC UM entity has capability of segmentation/concatenation. It means ... if the incoming data is greater than the RLC size, it segment the data into multiple chunks and passthem one by one. In this case, you have to put some tag (number) to each of the chunks.. otherwise the receiving side cannot combine them in proper sequence. This tag (number) is SN (Sequence Number). As you see in the following diagram, there are two different types of SN. One is 5 bits and the other one is 10 bits. What if the a lot of small sized data packets are coming into the RLC entity ? The simplest way is to pack the small chunk as it is (as in TM mode), but it is waste of space. Followings are the descriptions for each field in the UMD PDU Header. E Field : This field indicate whether this field is the end of the header or another extention follows or not. FI Field : This field indicate the relative location of the RLC PDU within a RLC SDU. For example, '01' indicate the PDU is the first segment of the SDU and '10' indicates the PDU is the last segment of the SDU, and '11' indicate the PDU is in between the first and last segment. In a SDU, there is only one '01' type PDU and only one '10' type PDU. There can be one or more '11' type PDU. If FI is 00, it means the RLC PDU is same as RLC SDU. When RLC recieves '01' type, the layer start buffering the PDU within RLC memory and only when it recieves '10' PDU, RLC reassembles all the recieved PDU and transfer it to PDCP. In this section, you might have noticed that there are many different header types in UMD, but if you take a look at RRC configurations for RLC UM, there are not so many parameters to determined the header type. Actually there is only one parameter(sn-FieldLength) related to UMD header type. This is not enough to determined the exact UMD header type. For example, if we assume that sn-FieldLength is 5 bit, there are three possible UMD header type as shown below. Then you may ask how the receiving side RLC can figure out which header. The answer lies in 'E' field. The 'E' field in the first Octet and the 'E' field in the following bytes (Oct >= 2). The 'E' field in the first octet determines the header should be 'Case 1' or 'Case 2,3' and the 'E' field in the following octets (more specifically K value) determines whether the header type is Case 2 or Case 3. If K is 'odd num, the Case 2 header is used. If K is even number, Case 3 header is used. The last type of RLC packet type is AMD (AM mode data) structure. Overall structure is very similar to UMD structure except that it has a couple of additional field D/C, RF, P.
We saw many of small fields in RLC header and now let's try understanding the meaning of each of these fields. D/C Field : This field indicate whether the PDU is for RLC control or Data . RF Field : This field indicate tye type of the AMD PDU. P Field : This field indicate the PDU requires a status report (RLC ACK or NACK) from the other party or not. Following is the structure of STATUS PDU and I recommend you to be familiar with this structure because this would be very useful for various troubleshoot case. CPT Field : This field applies when PDU type is Control PDU. It indicates whether the PDU is STATUS or not. E1 Field : This field applies when PDU type is Control PDU. It indicates whether E1 and E1 follows or not. SOstart and SOend fields indicated the corresponding NACK_SN stands for 'detected as lost' which means a portion or the whole RLC PDU is lost. According to 36.322, section 6.2.2.18, 6.2.2.19 descrbes these fields as follows. SOstart (15 bits) : The SOstart field (together with the SOend field) indicates the portion of the AMD PDU with SN = NACK_SN (the NACK_SN for which the SOstart is related to) that has been detected as lost at the receiving side of the AM RLC entity. SOend (15 bits) : The SOend field (together with the SOstart field) indicates the portion of the AMD PDU with SN = NACK_SN (the NACK_SN for which the SOend is related to) that has been detected as lost at the receiving side of the AM RLC entity. 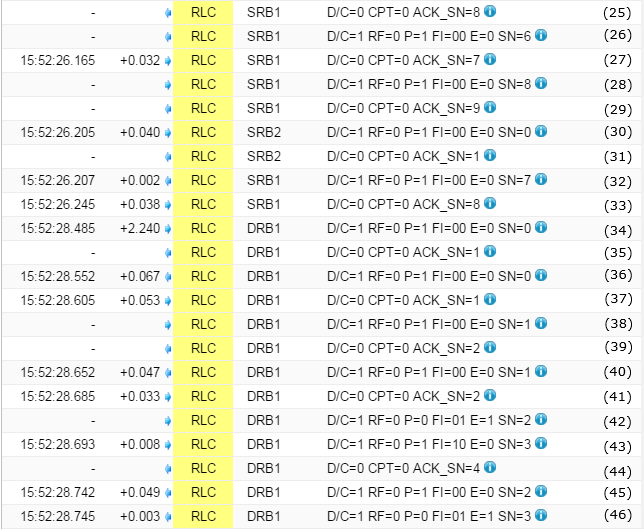 When you don't have automatic RLC decoder and you have to manually decode RLC header, you can get a lot of hints just by the first 4 bits of RLC PDU as listed below. Check this table with the examples. Followings are a couple of RLC PDU example. In RLC PDU case, especially AMD PDU case, you should anlayze several consecutive PDUs in both direction for you to get overal picture. With these examples, you would learn and get familiar to how to utilize all the tables/diagrams shown above. E1 = 0 (It means that Octat 2 is the last Octat for this RLC PDU). E1 = 1 (1 bit, It means that this is not the end of RLC PDU). NOTE : The first two bytes (80 54) is the PDCP header and the remaining part is IP packet. If you copy the whole SDU2 data from the third byte(i.e, 45 00 ..) and decode it with 3GPP decoder, you can see the contents of the IP packet. NOTE : The first two bytes (80 55) is the PDCP header and the remaining part is IP packet. If you copy the whole SDU2 data from the third byte(i.e, 45 00 ..) and decode it with 3GPP decoder, you can see the contents of the IP packet. Refer to Live Network Examples in Fullstack. 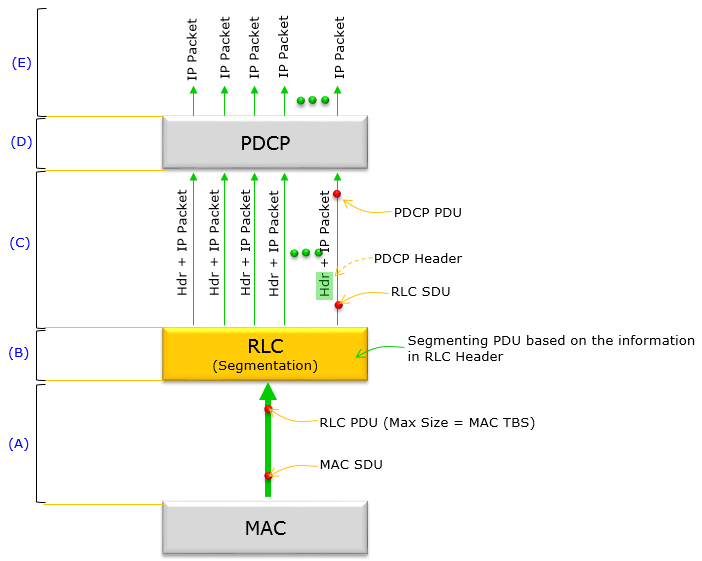 You may need to put some more effort to find out RLC layer log from this example, but you will see more diverse RLC PDU/SDU structure and see the relationship between RLC and other layers. You may noticed that the overall data flow of RLC sounds relatively easy to understand. But understanding the RLC layer mechanism in such a detail that would help you with troubleshooting and RLC performance optimization would not be a simple task. For the level of understanding like this, you need to understand the details of 3GPP 36.322 section 7 (Variables, constants and timers) and 3GPP 36.322 section 5 (Procedures). I would suggest to study section 7 first and then the section 5. This state variable holds the value of the SN of the next AMD PDU for which a positive acknowledgment is to be received in-sequence, and it serves as the lower edge of the transmitting window. It is initially set to 0, and is updated whenever the AM RLC entity receives a positive acknowledgment for an AMD PDU with SN = VT(A). This state variable holds the value of the SN to be assigned for the next newly generated AMD PDU. it serves as the lower edge of the receiving window. It is initially set to 0, and is updated whenever the AM RLC entity receives an AMD PDU with SN = VR(R). it holds the value of the SN of the first AMD PDU that is beyond the receiving window and serves as the higher edge of the receiving window. This state variable holds the value of the SN following the SN of the RLC data PDU with the highest SN among received RLC data PDUs. It is initially set to 0. This state variable holds the value of the SN to be assigned for the next newly generated UMD PDU. It is initially set to 0, and is updated whenever the UM RLC entity delivers an UMD PDU with SN = VT(US). This state variable holds the value of VT(S)-1 upon the most recent transmission of a RLC data PDU with the poll bit set to '1'. It is initially set to 0. This counter counts the number of retransmissions of an AMD PDU. There is one RETX_COUNT counter per PDU that needs to be retransmitted. This timer is used by the receiving side of an AM RLC entity and receiving UM RLC entity in order to detect loss of RLC PDUs at lower layer. only one t-Reordering per RLC entity is running at a given time. The process is simple. If I describe it in a psuedo code, it will be as follows. The reception process is described in "36.322 5.1.2.2 Receive operations" and at high level point of view the process goes as follows. Comparing to transmission process, you would immediately notice that recieiving process is much more complicated. The main reason of this complexity lies in the fact that you cannot guarantee that all the PDUs are coming in exact order (i.e, in-sequence). So we have to implement a specific algorithm to handle the case when these PDUs are coming out-of-sequence. - a SN falls outside of the reordering window otherwise. - update state variables, reassemble and deliver RLC SDUs to upper layer and start t-Reordering as needed (Refer to < Case 3 >). Looking into this procedure in more detail, it can be split into following three sub process (cases). This process is described in 36.322 5.1.2.2.3 Actions when an UMD PDU is placed in the reception buffer. I will summarise the process as follows. ii) VR(UX) = VR(UH) . I think one of the biggest issues with RLC test would be that most of the test equipt does not provide much flexibility in terms of RLC layer testing. Most of the equipment seems to think of RLC as just an intermediate blocks between PHY/MAC and RRC/NAS and think that just providing a normal RLC functionality as a big chunk with very limited user configuration would be good enough, and most of the customer of those equipment vendor does not put many strong requests for it. It may be OK and I haven't seen many cases where RLC layer is causing any serious issues, but sometimes this layer is really causing some problem and once the problem happens in this layer it tend to be really tricky to pin point out the root cause of the problem. i) When a bunch of RLC PDU/SDUs coming into RLC reciever with out-of sequence, the reciever fails to properly reorder it in correct sequence. ii) When a bunch of RLC PDU/SDUs coming into RLC reciever with some missing sequence number, the receiver fails to detect the exact missing sequence number and send proper RLC status report to the other party. iii) When a RLC sender send a RLC packet with Poll Bit Set, the reciever failed to reply with correct RLC status report or the status report within the specified time frame. i) In real network (live network), it is not guaranteed that Network would allocate enough resource for the UE so that it can transmit a whole U-plane/C-plane packet without fragmentation. ii) Even though the network would allocate the big enough resources for the UE, you cannot guarantee that it would allocate the resources before RLC timer get expired. (this would be less probable, but possible in theory).